Got... No credit? No Problem! Bad credit? No Problem! Bankruptcy, foreclosure, repossessions, collections, charge offs, judgments, tax liens or all the above...It's NO Problem! There are lenders out there that are eagerly awaiting your loan application and they will say yes! They're approving thousands of customers with credit issues daily and you can be their next approval if you know where to find them. There are NO turn downs no matter how bad your credit may be. I'll share who they are in a bit, but keep reading as there are some very important things to know before you start applying for loans. What this bad credit car buying guide is going to do is show you where to find these lenders, how to get the best bad credit auto loans and what to expect when buying a car with bad credit. In addition, you'll learn about your credit, what cars you can buy and what scams to watch out for. Follow this simple 4 step bad credit car buying guide and you'll save yourself big bucks on your monthly payments and thousands of dollars over the life of your loan. This information is "What You Must Know Before You Go! What a lender considers "bad credit"
I know that you wouldn't even be reading the bad credit car buying guide if you didn't already know that you have some credit issues, but how bad are those issues? Have you actually seen your credit or are you just taking someone else's word for it? Do you know what your credit score is? You must know what your credit report says. If you don't, then buying a car with bad credit is like playing darts with a blindfold on...You're gonna' hit something, but it may not be what you were hoping for! Go ahead and Check your Credit Report and Score for $1 with Enrollment at CreditReport.com. Doing this now will make following along with the bad credit car buying guide that much easier. 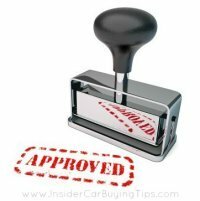 You must not let the car dealer know more about your credit than you do. If they are the first one to see your report, then they could potentially exaggerate the small things for their financial gain! Even if you are working with a legitimate dealer and they are being honest with you, what if your credit score is 522, but most of the better non-prime lenders won't consider applications under 540 (true in many cases)? Because of 18 easy to gain back points you are automatically disqualified from using a lender that may have approved you for a loan at 16%, but now are stuck using a lender that may charge you 24%. That 8% spread makes a big difference in your monthly payments ($50, $60, $70 or more) and how much you pay in finance charges (like thousands of dollars over the loan). Buying a car with bad credit can get expensive, due to these high rates, and you want to do all you can to get the lowest rates possible. I've seen many, many, many customers in this same situation that could have either filed chapter 7 bankruptcy or waited 2-3 months, cleaned up some basic stuff on their credit and would have saved themselves $50-$75 a month and possibly thousands of dollars over the life of their loan. If you have small collections that you can easily settle, then do it. Every collection account reporting to your credit file drags your score down 10-40 points. If you have 3 small medical collections, settle them all and boost your score a quick 30-120 points. Be sure to have those collections removed completely, and not just shown as settled accounts, for maximum score boost and effect. There are three different levels of bad credit car buying that I'd like to cover here. I'll base these examples solely on credit score, because to get into all the other details would turn this page into a book. If you fall in this range you would be in the sub-prime credit tier. Rates are usually in the 20's, loan terms are short (under 54 months), down payment usually needs to be larger, vehicle selection is limited and there are fewer lenders to choose from. You definitely want out of here! Start working on it today, because you will be wasting far too much money on high interest charges no matter what type of loan you get. If you fall into this range you would be in the upper sub-prime and lower non-prime credit tier. Rates in the high teens, loan terms up to 72 months (on select vehicles), down payment in the 10% minimum range (sometimes less). Take a look here how one point kept this visitor and his wife from getting a Corvette - 519 Credit Score. See why it's worth it to stay on top of your credit? Many more options for you here in the non-prime credit tier. More lenders available, rates from 12-18%, can borrow more, less money down (in some cases no money down). If you absolutely have to have a car now, then you may not have a choice and can move on to the next section of the bad credit car buying guide to find out where to get a loan. If you have some time and the desire, then I'd absolutely recommend you do clean up some or all of your credit. Boosting your score and cleaning up your credit file will have a dramatic impact on all the factors mentioned above. Why buy a car today with $450 a month payments, when you could do a little work, wait a couple of months and buy the same car with payments of only $325 a month? Get your Credit Report with enrollment at CreditReport.com! Can't Wait? Then Let's Get Some Money! If you don't have the time to wait and need or just want to buy your new car now, then let's take a look at how to buy a car with bad credit auto loans. It's not as hard to get approved as you may think and, as mentioned above, there are lenders that 100% approve all credit situations.